I'm always looking for ways to add more vegetables to our diet. This is one of my favorites! Recently, despite years of claiming otherwise, I realized that I absolutely love eggplant. I even grew a few in my garden this summer. 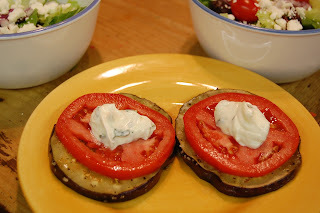 One of my favorite ways to use eggplant comes from Laylita's Recipes. Anna's Eggplant Appetizer consists of grilled eggplant slices topped with slices of juicy, red tomato and a dollop of garlic-Parmesan mayo. Simple and delicious! You can find the recipe (as well as the story behind the recipe) at Laylita's Recipes. While you're there be sure to check out all of Layla's beautiful photos and yummy sounding recipes. I wasn't familiar with Ecuadorian food but after browsing this blog, I can see it's likely to become one of my favorite cuisines!